If you are like me and most people I know, you don’t have money to throw around on camera gear that isn’t going to do what you want. You need to be careful when choosing the right camera. You can spend hours watching Youtube videos of reviews and opinions, most of which are people just reading out a spec sheet and either praising or defaming the manufacturer for their efforts. Occasionally you will find a pixel peeper that runs complex tests in scientific conditions that still are meaningless to most of us. So, after hours and hours of research what do you do? 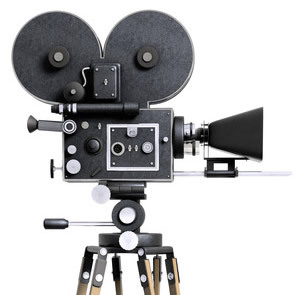 Most reviews end with a non-committal statement like “everyone is different, you have to find the right camera for you”. So how do you find that right camera? Being impartial when choosing the right camera. 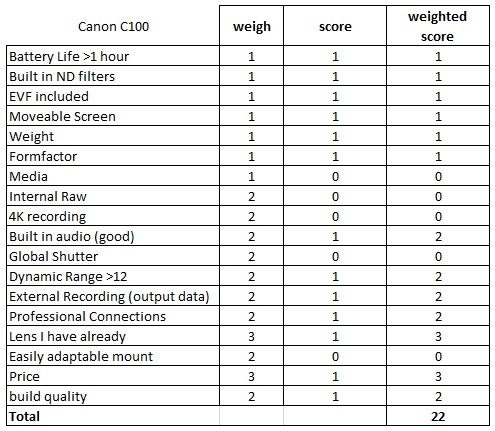 When choosing the right camera you must use an impartial consistent assessment tool, something like a weighted score card. This type of tool is used to make complex and important decisions in business all the time. You list factors that are measurable in all examples, even the lack of a feature is measurable. In the next column you place a weighting for each factor based on the importance to you. You can now score each camera and get a weighted score telling you the winner. I have done this for a Blackmagic Pocket Cinema Camera 4k (BMPCC4K) and a Canon C100 Mk2. If you look at the results you will see that the Canon is the winner by a small margin. However, the C100 doesn’t do 4K. If that was weighted higher the BMPCC4K would win. But with this weighting the fact that I own some nice Canon L Series glass, plus great battery life pushed it over the top. The most important thing in this exercise is the weighting. You must put a huge amount of effort into really considering what is important to you. Then use that to find the camera that best suits you. As you know if you have read other posts on this site I have a BMPCC4K (see my rig) and therefore I am slightly biased. I am a fan of the C100 and I am encouraging my daughter to get one as it would be a great camera for small events. So, list every factor that you know and that you can measure, then how important they are and you will remove emotion and the “influencer” effect from your next camera purchase.